yes, you read correctly! i've teamed up with an awesome group of bloggers to bring you this awesome summer giveaway. are you ready for a laptop upgrade (i know i am! 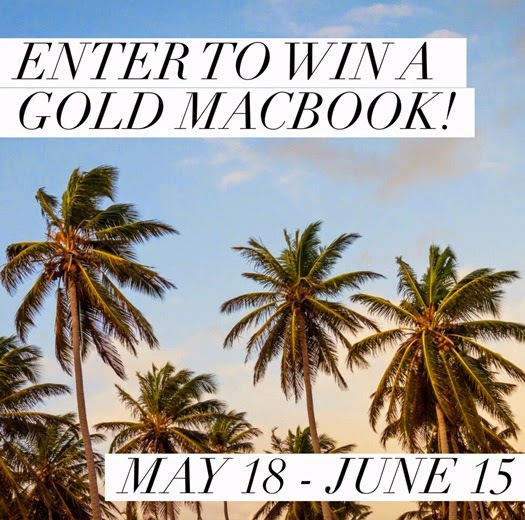 ), then here's your chance to win a gold macbook! take your time and get through those entries...each one increases your chance of winning! bookmark this page and come back daily to enter. interested in participating in giveaways like these? click here for details. I only have one day of school left this year and my kids are so awesome. Today they wrote me letters about how they are going to miss me next year! These are 9th graders here. OMG this is crazy! I love this MAC and more in gold like for real? Omg! Thank you for the great chance! Nothing better than a lazy Saturday. I would so love to have this for college and social media! So sleek! My children woke up happy! I woke up and actually did some yoga. I feel great right now! I did some yoga that makes me feel excellent! I slept 12 hours and feel great! Being outside all day is great! Enjoying the day before going to work in the afternoon. Getting a yummy latte from Starbucks! Working on some art projects! Had an amazing session in Yoga and then a healthy dinner with my family!